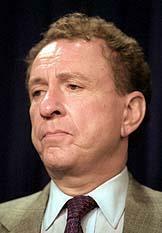 Controversial remarks by Sen. Arlen Specter, cautioning President Bush against nominating Supreme Court justices who would overturn the Roe vs. Wade abortion decision, have sparked a furious outcry from Bush's large conservative and Evangelical support base, and spawned a movement to ensure the Pennsylvania Republican does not ascend to chairmanship of the Senate Judiciary Committee as expected. Did Specter cost Bush Pennsylvania? The Ohio factor: Did Homeland Security and the FBI interfere with the vote count? 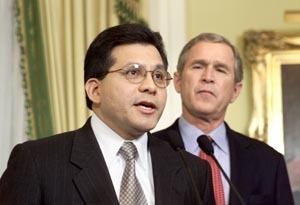 Alberto Gonzales, tabbed by "conservative" President Bush to be the next Attorney General, has a Kerry-like record on social issues. So what else is new?! Barely a week has passed since 84 percent of the nation's self-described conservatives cast their ballots for George W. Bush, and already the president and his administration have delivered at least two good, strong, swift kicks in the teeth to the voters who elected him. Speaking in Mexico this week Secretary of State Colin Powell acknowledged that the administration will revive its amnesty plan for illegal aliens, and in Washington Hispanic White House counsel Alberto Gonzales was named as the next attorney general. The reelection of George W. Bush: A possible bright side? Israeli FM Silvan Shalom: "She is a true friend to Israel." What if the revisionists are right? "To encourage Jewish emigration, the National Socialists worked closely with Zionist organizations, which were interested in encouraging the emigration to Palestine of as many Jews as possible.¼"
Rhetoric aside, little of substance separated George W. Bush from John Kerry — and a second Bush term will do nothing to reduce the size, expense, and power of government. Why isn't Kerry using $50M unspent campaign money to fund recounts? Schivo case judge can be removed from the bench--immediately! "The most apparent example of the Communist/Masonic infiltration of an organization is its successful infiltration of the Roman Catholic Church.¼"
Illegal aliens continue to enter the US at an alarming rate. 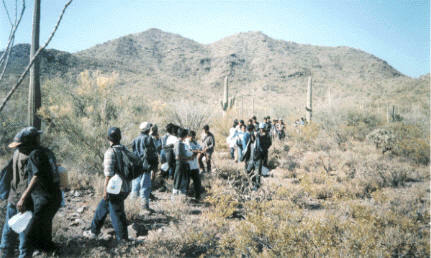 It's time that those who keep pushing amnesty should listen to the people. Among the ballot measures that passed resoundingly in the election is one that no conservative can afford to ignore — Arizona's Proposition 200. It is a measure that will require proof of U.S. citizenship for voting and proof of legal residency for many public services. 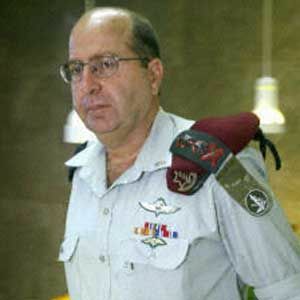 A leading Israeli rights group demanded the army chief-of-staff Moshe Ya'alon (right) resign. Israel's once-unshakable faith in the morality of the army has been put to the test by a series of recent scandals, one of which saw a soldier empty his weapon into the body of a young Palestinian girl, who had been killed moments earlier on her way to school. It has not been a particularly good couple of weeks for an army which proclaims itself to be "the most ethical army in the world." Is annexation of Canada part of Bush's military agenda? Reward: $100,000 for proof of government claims how WTC came down!